Please watch this video to compare our work!! Most bobblehead providers use polymer clay ( Bad Quality ) and then they bake and mold the dolls, you even can see the maker's finger print on the dolls, and the dolls are easily broken. this material will dry out and crack after a year - all that money you spend on making a keepsake goes down the drain. We uses Poly Resin ( Good Quality) to create the bobbleheads. this is the same material that we use in our retail bobbleheads. We are equally proud of our customer service team. They go the extra mile to meet all your needs, making sure you are kept current on the progress of your doll and that every detail is captured. They are ready to brainstorm with you to design your bobblehead, too. Because we know your bobbleheads are often special gifts for important events, we do everything in our power to get them to you on time. We've heard dozens of horror stories about the important centerpiece of the event, a bobblehead ordered from our competitors, that did not arrive in time. 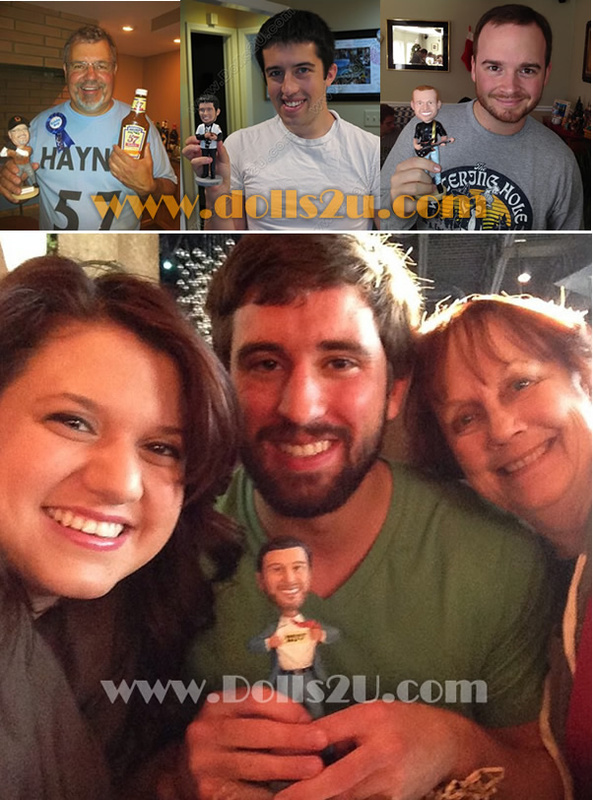 Dolls2u was the first large bobblehead company to make individual bobbleheads, and we've been making them for many years now. Over 96% of our customers would recommend us to a friend, which is quite a testimonial! We know the best way to keep our business healthy and growing is to give you an excellent product and top-notch service. We uses Poly Resin to create the bobbleheads. this is the same material that we use in our retail bobbleheads.